The National Union of Ghana Students (NUGS) has called for the dismissal of the National Youth Authority (NYA) boss, Ras Mohammed Mubarak, over what they claim to be a blatant disregard for the interest of Ghanaian students. 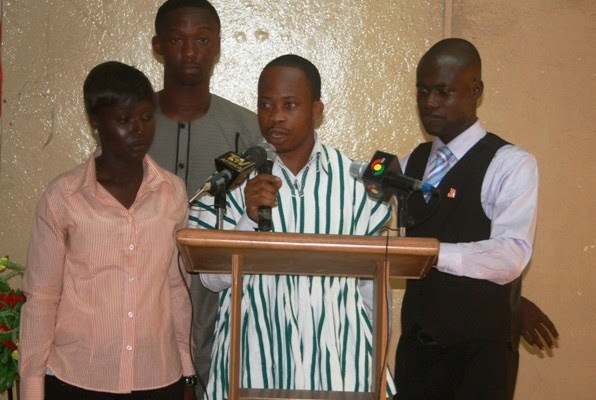 At a media briefing held at the University of Ghana City Campus on Wednesday, the executive body of the student union pointed out that Ras Mubarak had deliberately refused to engage the leadership of student youth groups in the process which led to the launch of the National Youth Policy. According to the NUGS president, in an attempt to contact Ras Mubarak for information regarding the Authority, the latter sent him a message asking him to visit the NYA website for that information and that if the student union still had questions he (Ras Mubarak) would assign officers to address such questions. “National Youth Authority is a body that is supposed to make sure that it serves as a liaison between government and the youth of this country. We don’t believe the gentleman is doing that. Ideally, he should engage the youth of this country from the stage of formulation of the national youth policy to the stage of launching. It has not been done. We want someone who will be able to engage the youth of this country in decision making to be in that position. If he cannot engage us then we do not think he is competent enough to be there. That is why we are calling for his dismissal,” Mr Dzitse stated. Mr Dzitse expressed worry over the increasingly exacerbating energy crisis, noting that it was having a devastating effect on students and the educational sector in general. “Teaching and learning cannot go on smoothly in our schools because of the agonising intermittent power supply which to a large extent is blamable for the poor academic performance of many students lately. It is not more unusual to see students walk long distance at night in a desperate attempt to find lights so they can study. In some cases they are compelled to study by the streets of our cities, taking advantage of the streetlights. We ask our government, for how long should this ugly spectacle continue? Must we all withdraw from school or lose our lives before government appreciates the gravity of this crisis and do something about it,” he quizzed. He called on government to treat the energy crisis as a matter of urgency since energy remains the number one driver of our economy. The union also pleaded with organisations and employers to stop demanding for graduates with two to five years working experience on the job market since it was impossible to get fresh graduates with such experiences.